Since July 2005, I have traveled frequently a very long distance to visit a familiar country, Australia, I have had several international exhibitions include solo exhibitions. share my ideals with the world, through art. What I have painted on the canvas represents, for me, a going back to nature and a return to the human’s pure, native state. My “Maehwa(Plum Blossoms)” paintings reach beyond the mere aesthetic beauty of the subject, bringing to bear symbolic meaning, especially in the realm of Korea’s emotional disposition: the noble character and strong discipline of the dedicated scholar. It is easy to imagine the tree and its beautiful flowers as symbolic of struggle and life’s perpetual soldiering on. The act of blossoming is both gentle and forceful. The petal’s delicacy contrasts to gnarled boughs and rough twisted trunks. The Maehwa stretches toward the unreachable sky with an unyielding tenacity. 개인전: OCT 1(월)~30(화), 오픈식1 OCT 5(금) 시간? Nov 5 Departure to Korea. It is just around the corner to departure to Australia. I will have a solo exhibition (include workshops) in Gold Coast and plein-air painting in Brisbane, Uki and Gold Coast for 7 weeks. Right now Australia is on the door step of Spring. I am eager to paint the blooming blossoms in the vibrant land especially the fantastic Jacaranda. Most of all it will be an happy time to meet the old and new Australian friends who love my art since 2005. I will try to post for more detailed plan very soon. The attached photo took in 2017 in Brisbane. 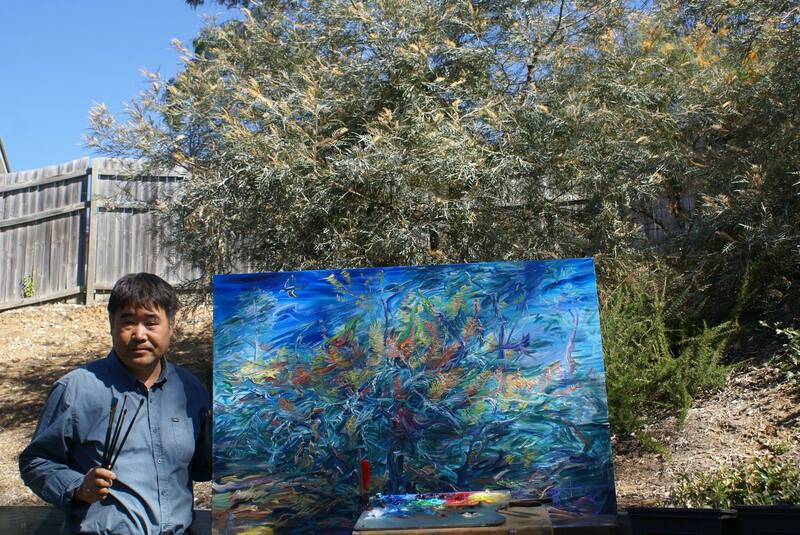 I am proud that I can show my diverse vital fantasy series of art in Australia. 이제 몇 일후 호주로 떠난다. 7주 동안 브리즈번, 유카이, 골드 코스트에서 캔버스를 펼치고 봄꽃과 그곳의 이국적인 아름다움을 그릴 것이고 한 달간 개인전과 워크샵도 계획되어 있다. 현지에서의 작업을 위해 그동안 호주인 들과 많은 협의가 있었고 한국애서 캔버스와 각종 도구를 모두 보낸 상태고 이제 마지막 점검 중이다. 호주는 한국과 반대 계절이기에 지금 그곳은 봄이 오고 있다. 그곳에서 황홀한 봄꽃을 특히 환상적인 자카란다를 그리고자 오랜 세월을 기다렸다. 무엇보다 2005년부터 지금까지 이어온 내 그림을 사랑하는 호주인들과 다시 함께 할 수 있는 것은 큰 기쁨이다. 그리고 다양하고 생명력 넘치는 내 그림을 다시 보여줄 수 있어서 자랑스럽게 생각한다. 보다 상세한 일정은 조만간 포스팅 하겠습니다. ps. 첨부한 사진은 작년 여름 호주 브리즈번에서.